Livin in a serviced studio apartment in Boat Lagoon is all good. My balcony overlooks the meandering mangrove river leading here. The air is fragrant with tropical blossoms. And in the mornings and especially the afternoons we have regular Minibus Mayhem when the minivans descend to deliver and collect the tourists who are heading for or have spent the day on Phi Phi Island or wherever. This week Minibus Mayhem reached giddy heights with minibuses double parked around the circle (roundabout to Australians) just before my apartment and a double decker coach joined the fray. The coach had to back up at least 500 metres because it simply couldn’t manoeuvre . What’s it going to look like in high season? View from our anchorage on Ko Phi Phi, Thailand. Coral as far as they eye could see inviting us to dive in for a snorkel. Ten grueling hours after leaving our safe haven on the east coast of Ko Lanta we finally arrived in Tonsai Bay at Ko Phi Phi, Thailand. It’s only 30 NM (nautical miles). Wondering why our trip took so long? Check out the story so far: What Could Possibly Go Wrong?, Stranded in Paradise and Still Stranded in Paradise. 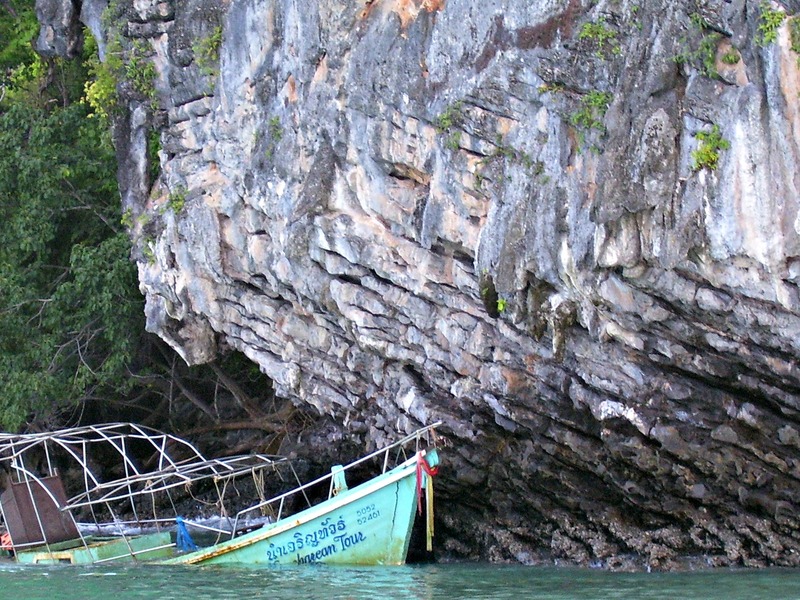 Were we going to make it to Ko Phi Phi Thailand? The whole situation felt scary and wrong. Our average speed was just three knots (about 5.5 kmph) with the wind and choppy swell coming from the direction in which we were headed. Sailing wasn’t an option. We had to use the engine despite our profound misgivings. 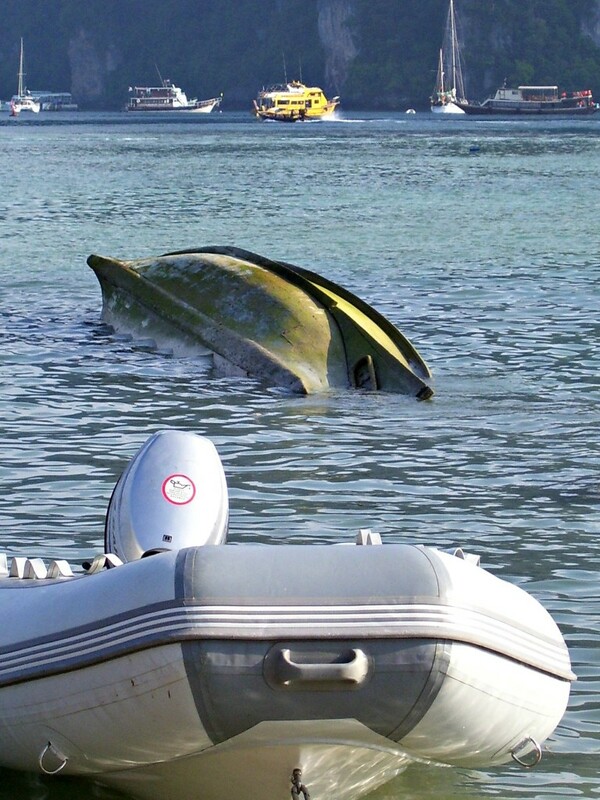 To make things worse, we were towing our new super size Queen Mary dinghy, slowing us down by at least one knot. However we had managed to wrangle Thumper (the outboard) onto the deck, so that helped a bit I guess. So, in between bouts of the Chief Engineer sweating it out in the engine room, trying to figure out how to fix the latest problems, we took a holiday on Ko Phi Phi Thailand. 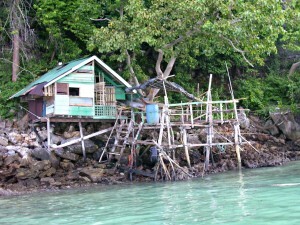 We were told by lots of people before we arrived that Ko Phi Phi’s a rat race. And compared to the serenity of Ko Muk and the laid back peace of Ko Lanta, Ko Phi Phi was swarming with tourists. Every day hordes of young backpackers in bikinis and bare chests came in on the ferries. We could hardly move on the narrow walking streets, or in the shops and restaurants. And this was the quiet season. By around four in the afternoon, the day trippers vanished leaving room to move but still plenty of action. 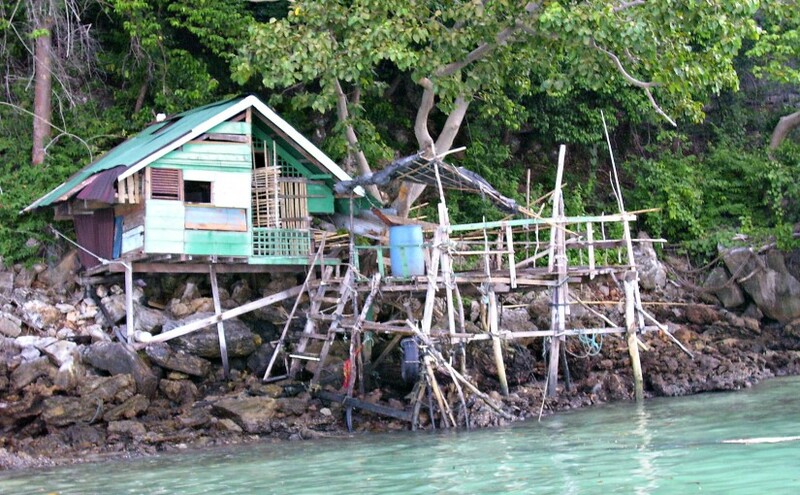 Budget accommodation in Tonsai Bay? Check out the crystal clear water. We played at being tourists for ten days – snorkeling, drinking cocktails and even shopping. 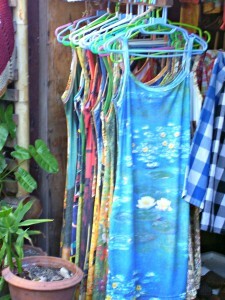 There was a stall selling dresses printed with famous Impressionist paintings. I had my eye on Monet’s Water Lillies, but they didn’t have my size (too big of course) so I settled for a Van Gogh instead. 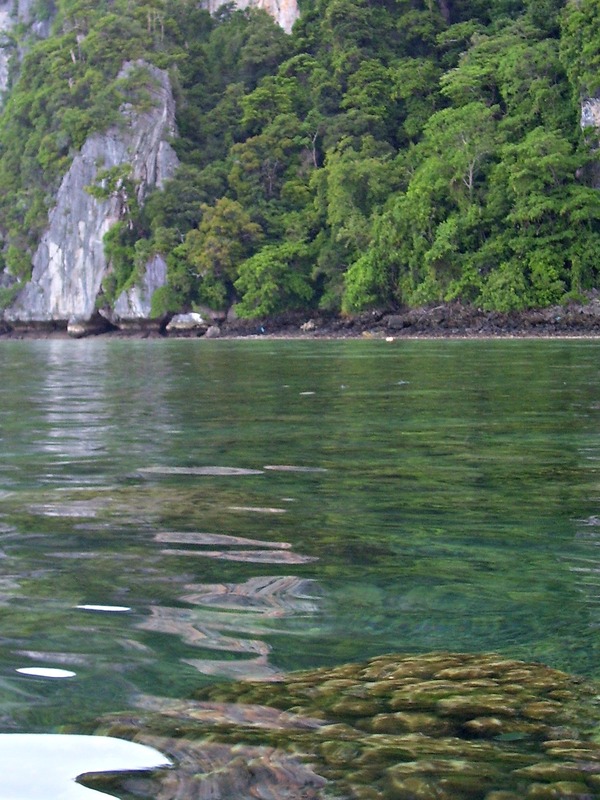 We were anchored in about 12 meters of clear as clear turquoise water. We could swim over to where the tour operators take the punters for snorkeling trips. The water was a perfect temperature with outstanding visibility. There were more fish in our face than we could poke a stick at, although the coral was sadly degraded. The weather was glorious and sunny for the whole time. I suppose you could call it a voluntary stranding in paradise. 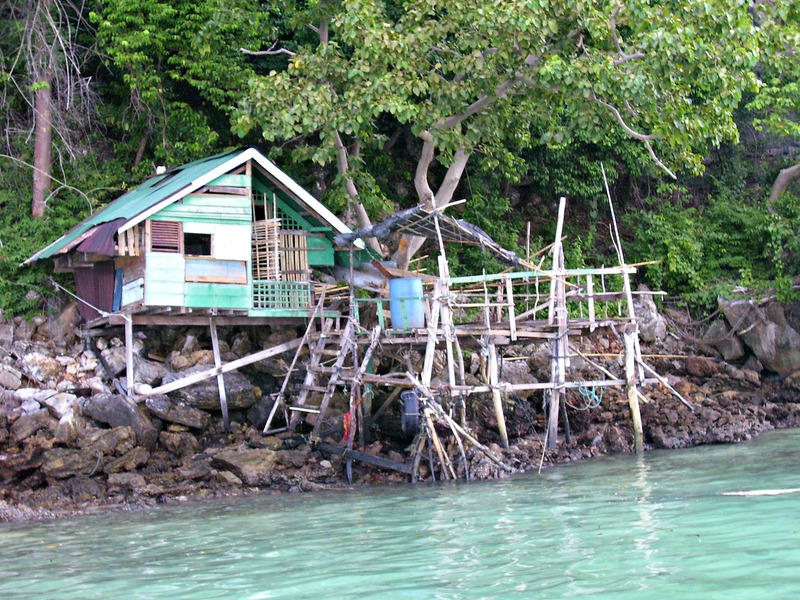 Ko Phi Phi Thailand is certainly a tourist paradise. The Chief Engineer (AKA the Other Captain) discovered and replaced a second broken engine mount. We discovered later our mechanic in Langkawi had tried to save us money by supplying non-marine engine mounts. We set off for a last overnight anchorage at Ko Yao Yai before heading in to Boat Lagoon at Phuket once the Chief Engineer managed to reduce the drive shaft wobble, after endless hours of trial and error in the engine room. This leg was an uneventful 16 miles, again at an average of three knots, but with very little swell. The final leg of 13 miles to the entrance of Boat Lagoon was even easier – no swell whatsoever, totally benign conditions. We parked Yana in the mud at Boat Lagoon Marina. Finally.